I owe a debt for my existence, not just to my genetic ancestors, but to my cultural predecessors. There’s more than one way to reckon descent: there is the genealogical, the genetic, the cultural. I count Benjamin Franklin as a grandfather on the basis that I was raised by public libraries. I’m a product of values and revolutions in thought going back centuries. I have more parents and grandparents in movements for knowledge, pride, and justice than I can count. But most of the people who have lived and made my life better aren’t in the history books. Although I was pretty sure my family didn’t arrive in the United States until after 1850, and never owned slaves (or were enslaved), I knew that I owed a debt for the privileges that have come to me as a white American, that my life and identity are based upon, that I did nothing to create. I began to wonder where my ancestors were, exactly, while America was becoming the place that would change our destinies. What did that intersection look like, where my family joined the American experience, and what led up to it? Lots of people are curious about their family origins, but have not sought them out. Some might not know where to begin, not even what questions to ask that would get them started. The advice that other genealogists give to newbies is to capture living knowledge, by talking to the oldest members of one’s family. I did this by proxy: my sister interviewed our great-uncle Joseph Cascio in 2001, for an anthropology class project. When I declared an interest in putting together our genealogy, she emailed me her final paper, and a few other documents, including a table of names and dates that derived from our great uncle Warren’s research on the other side of our family. Right from the beginning, I was relying upon the work of others. I could figure out some of the relationships among people in the table, but others were mysteries. Not only might I misinterpret what data I had, but the data itself might be incorrect: there were no citations, no sources. I would have to confirm every name and date in a primary document. On an intuitive level, I understood the great chasm between having questionable facts—otherwise known as hypotheses—and nothing at all. Researching my family’s genealogy has been a rewarding lesson in acting with confidence, while still leaving room to be wrong. I knew that Cascio was not an uncommon surname, but when I began my search for Leoluca Cascio—my great-grandfather, who immigrated from Corleone, Sicily—I still assumed that his first name was unusual. After reviewing a few hundred birth records, and finding the second or third Leoluca Cascio, I began to realize my error. Cascio is a common surname throughout Italy, but it turns out that Leoluca is an exceptionally popular name in Corleone because he is a patron saint of the town. I’ve since found at least twenty men who lived in Corleone who were named Leoluca Cascio. I’ve also found five Angela Grizzaffis (the name of his mother, my great-great-grandmother) and innumerable Marias, Antoninos, Gaetanas, and Giuseppes. Engaging in inductive research helped me understand the context in which those records existed. Captured initially by the Catholic Church, then the Mormon church, now online for my convenience, I had the leisure to develop mastery. I could even come to anticipate certain common errors. I’d at first assumed that in Italian records, the name “Cascio” would always be spelled the same way. No more “Cassios” or “Cashios,” as I find in US Census records. But in Sicilian dialect, new issues emerge. “Cascio” sounds like “Castro.” In fact, so many Cascios and Castros are called by the other’s name, in one record or another, that to skip all of the Castros in the Corleone records on the assumption that they’re not my relatives would mean missing a lot of family. I’d also been ignoring the “Lo Cascio” name in my searches, not appreciating just how often surnames would be rendered variously in the plural or the singular (“Colletti” and “Colletto,” for instance), or with or without an article or prefix, like “Lo” or “Di.” In English, “Lo Cascio” is alphabetized in the Ls—is a separate name—from “Cascio.” Not so to the Italian speaker. I took another look at the Lo Cascios, and found that they were the same family, sometimes the same individuals, referred to by different versions of the same name. These were not the only errors in the records. In US Census records, my grandfather appears as a female in one census, and my great-great-grandmother appears as a man in another. I’ve found a small handful of Sicilian baptismal records that I believe get the name of one parent entirely wrong, possibly confused with a godparent or another relative. More common is for calculated birth years to float, with people seeming to grow older or younger over time, based on their reported ages. The worst offenders are death records, for the scientific reasons that at one’s maximal age and no longer able to self-report, there is the greatest margin of error. When an infant dies, the age is generally reported with the utmost accuracy by the grieving parents, even down to the day. There is some consistency to the inconsistency, or at least patterns to it, and the best way to discover them is to take as large a sample as possible. I discovered the Cascio/Castro conflation because of one man with an uncommon name. When I started my research, with my assumptions about what “real” Italian names sound like, I could not have guessed at the difference in popularity between the names Leoluca and Spiridione. Thousands of records later, I could compose “Top Baby Name” lists for boys and girls of 19th century Corleone off the top of my head. After a couple months of searching, when I couldn’t seem to make a connection between nearer and more distant ancestors, I started to despair of ever being able to prove my genealogical history. I wondered if my grandmother had pulled my leg all those years ago, with her stories of going to Corleone with Grandpa, to visit cousins. I grew existential: obviously I am here, I thought, and was born of two people who in turn came from two parents, and so forth. Would that have to be a sufficient answer to the question I’d posed about how we became American? I had a few more advantages in this search than many people, and I wanted to be able to say that I’d done all I could to discover what I could about where I am from: that I hadn’t wasted the privilege. I made my cast wider, kept searching for a sibling group that matched great-uncle Joseph’s story. The first time I opened a document full of messily handwritten Latin, full of abbreviations, I slammed it shut again (to the extent one can “slam” shut a browser tab). I was daunted at the prospect of reviewing several thousand page long record books in two foreign languages. But as my comfort level rose, that messy handwriting became a beguiling thicket, in which knowledge was hidden, and I couldn’t stay away. Even now, every time I see my name written on a page, I feel like I’ve found Waldo. The first time I looked at a ship manifest, it didn’t dawn on me how the people traveling together might be related. I did not even recognize some of the travelers as nuclear families: I hadn’t realized that Sicilian women kept their surnames their whole lives, and didn’t consider it until I’d seen them preserved in Corleonesi records. There is not only one passenger on a ship manifest, a single person in isolation. By looking at everyone else who came from Corleone at the same time, understanding the naming conventions, and taking in all of the details—who they’re with, who they’re traveling to join—families emerged. When my ancestor, Angela Grizzaffi, came to the United States, she went to her sister’s family, bringing four of her children. Later, her brother joined her with two more of his sister’s children. In the years that follow, I can see at least three nephews of Angela immigrate, and go to stay with her. It’s not only the direct line of descent who have brought me here, but all of those aunts and uncles, godparents and cousins and step-parents, who supported them. And though the family legend condenses the sibling group to a single immigration, the truth is messier: I’ve seen whole families make the trip more than once, and young children traveling alone to meet their parents. Only by collecting all of the records, seeing them in context, and assembling them, could I make sense of the recorded facts. It should be possible to determine whether new data confirms what’s already known, or contradicts previously established facts. Once I became ready to be wrong, I prepared more thorough and clear notes that explain what I know and how I know it, in a way that will be easy for a stranger (such as a distant relative) to understand, and to update in the face of new information. In the case of a conflict, I can thoroughly document the facts as they’re presented, allowing for the opportunity to later update my analysis, instead of simply deciding to replace one fact with another, in the order that they come to my attention. Being ready to be wrong means not just building a tight argument for my case, but explaining it with courtesy and tact. One of the many inaccurate opinions I initially held of genealogy was that it would keep me safely far from the messiness of relations with my living family members, in the realm of the dead, who could not argue with me on inaccuracies in their life events or the ways in which I’ve presented them. Instead, researching my ancestors has brought me into contact with living relatives I have never met, and in some cases, never knew existed. I’ve developed an appreciation for those great uncles who became interested in these questions of our origins, and did the foundational work on which I have built. That some of what they discovered was inaccurate is less important, in the long run, because without their steps, I would not have taken my own. I believe what happened to me and great uncle Warren, is likely to happen to my son: that he’ll reach an age where he suddenly cares about words that had previously rung hollow for him, as they once did for me: heritage, legacy, respect for the dead. Maybe that extra generation he and my niece are removed from Sicilian culture will make the postings of banns, Latin baptismal names, formalized class divisions, and strong family ties, that much more foreign as to be unintelligible to them. I might be the necessary link, the generation who is able to bridge the gap between the 18th and 21st centuries. On the same day that I met my Corleonesi cousins through WikiTree, I was contacted by another person who thought we might be related, on my mother’s side. At first I wanted to dismiss this message as someone casting about in the dark, hoping to find someone who’s done this work already. How quickly I forget that I did not start my own search from nothing. I studied the names she sent me carefully, looked at my own tree, asked questions. In the end, I had to tell her that I didn’t think we were related, but to do so in a way that leaves the door open for either of us to discover that I am wrong about this, as well. 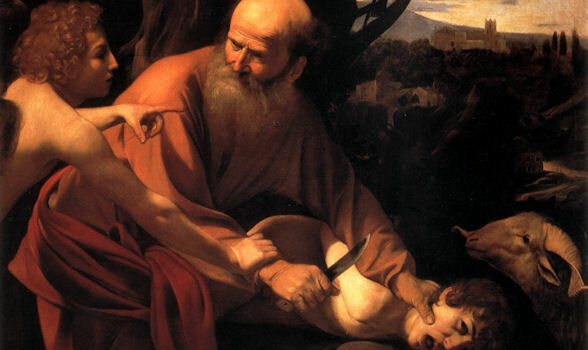 Image: “Sacrifice of Isaac,” Caravaggio, detail. Courtesy of carulmare.